First impressions: the bar is tiny and there's a wait to get in. 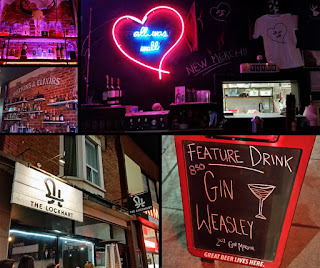 Now, I don't know if there's some rule in Toronto or something, but I was surprised that this bar worked on the premise that you could only go in if there was seating available. In other words, it wasn't like most bars I've been to where people just cram around the bar standing elbow to elbow. I wasn't super excited that I had to wait in line, but the group in front of us was like 8 people, so we got to jump the line a bit as we were only 3 in our group. Also, if you "checked-in" to their Facebook page, you could get onto their wi-fi for free from the line, so that made it a bit more bearable too (Side note: their wi-fi was called "Free Muggle Internet", nice subtle reference there). Once inside, I didn't really know what to expect. I guess I thought the Harry Potter theme would be a bit more overt, but it was more subtle. Don't let me undersell it, I mean, there were definite Harry Potter references and decorations around. It was just not as "in your face" as I thought it would be. That being said, the bar was great! There was dim lighting with some neon lighting here and there. Not to mention a giant skull up on the "potions" wall (the skull was real, I asked). The drink menu offered many drinks with allusions to HP characters and such. I got a butter beer and the drink special of the night, the "Gin Weasley". SPOILER ALERT: the Gin Weasley was just straight up gin with a few drops of orange bitters. Luckily, I love gin, but I probably should've asked about that one before ordering. We also got a bit peckish and ordered some polenta fries which were excellent! 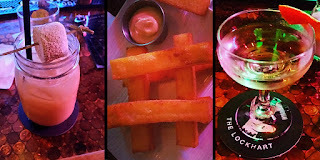 I don't know that they realized they had stacked the fries into a hashtag, but I did the obligatory #hashtag post of them on Instagram while there. One drink I didn't get to order (and also did not get a picture of, unfortunately), was the "Befuddleme". This drink was definitely a crowd-pleaser. It is a shared cocktail that comes in a large goblet with shots stacked in the middle. The top shot is lit on fire, and then at your table, they spray the flame with aerosolized Bacardi 151. This creates a HUGE flame with edges of green. I have to admit, it was awesome to watch. 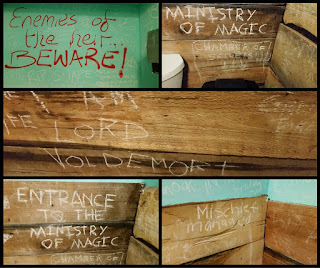 Lastly, a surprising find was that the bathrooms were covered in HP references! (Yes, I took pictures in the bathroom, but NOT while I was using it!) 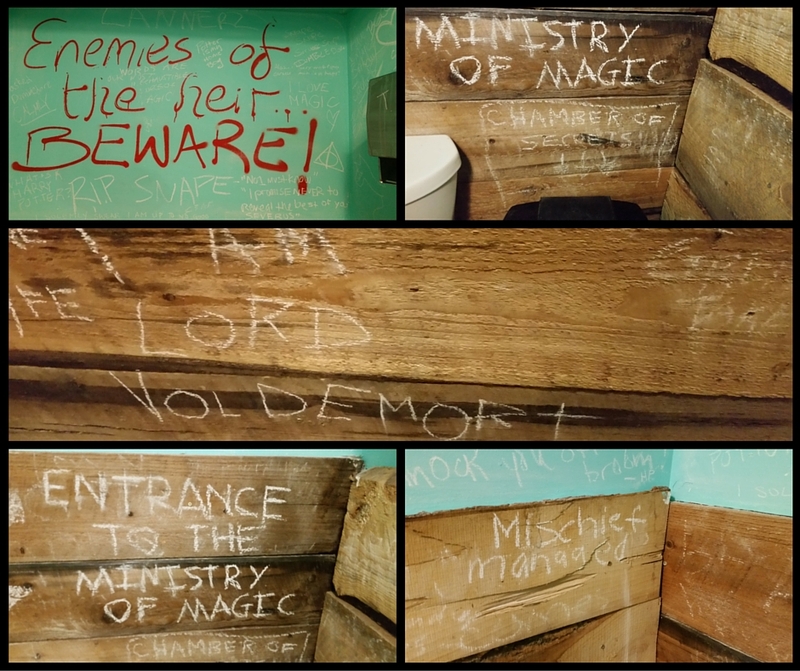 It was a bit sad because there were a lot of "RIP SNAPE" writings on the wall (maybe not the best place to pay tribute to him?). There was a bit of chalk there for you to add your own message, but I was a bit tipsy by this point and couldn't think of anything to write. I appreciated the open offer though. Some of the graffiti in the restroom. All in all, a good time was had by all. I would definitely like to visit this bar again! 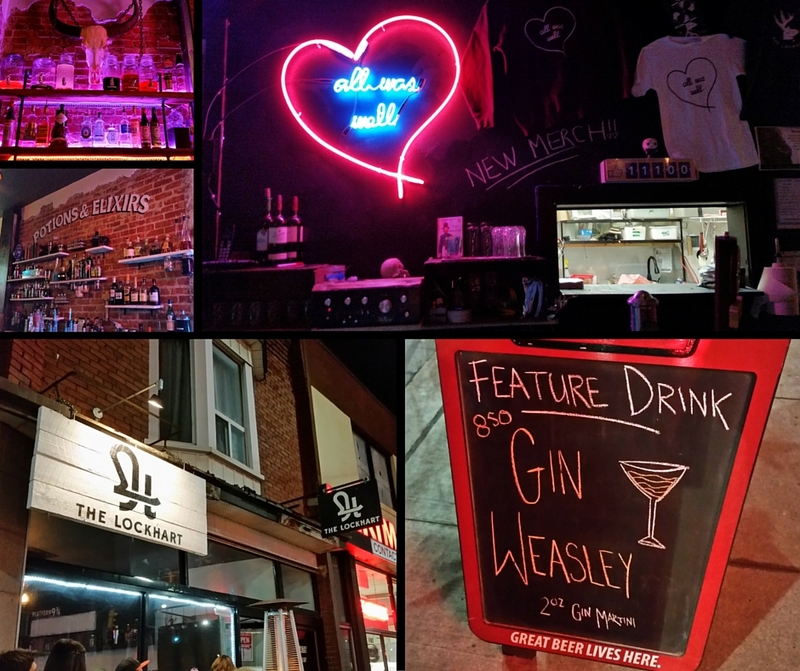 If you find yourself in Toronto, I say give this place a try even if you aren't a fan of Harry Potter! P.S. Why wouldn't you be a fan of Harry Potter?